Are you searching for a home care provider that can keep you safe and give you excellent support from the comfort of your own home? We understand that this task can feel like a huge undertaking. But don’t worry, we’re here to help. If you follow this guide, you’ll be able to locate the best in-home caregiver for you and your individual needs. When starting your search, you’ll need to begin by identifying the level of care you need. To do this, ask yourself if you need medical care, non-medical care, or both. This will help you to narrow things down when looking for a home health agency. Different home health agencies offer different kinds of care. To find the best one for you, it’s important to understand the variations between these agencies. Here are the most common types of home health care. Basic care includes “homemaker” services like cleaning, preparing meals, shopping, and laundry. This can be separate from a medical care provider or combined. Social care providers can help with counseling or linking you with appropriate community-based services and support. These providers can offer help from the comfort of your own home. If you need at-home medical aid, you may want to look into home visits from a doctor or nurse. They will be able to diagnose medical issues and provide medical care. 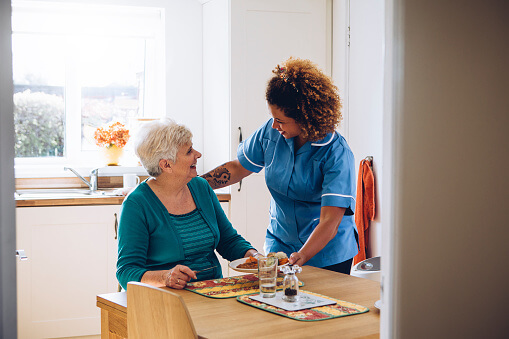 A home health aide can assist with tasks such as getting from one room to another, getting dressed, bathing, and more. These providers are great for those who have physical limitations which prevent them from completing everyday responsibilities. These home care providers should have an HHA (Home Health Aide) certificate. This will ensure that they have the proper qualifications. Keep in mind that an HHA certificate has different requirements in different states. How long have you been working in the home care industry? Are you available twenty-four hours a day? During your search for the best home care provider for you, remember to take your time. Although you may feel anxious to find a good match, you may need to speak to many different agencies before you find the right one. For the best results, be sure to follow the guide above. Remember to start by identifying your individual needs, to ask lots of questions, and to look into each agency and provider’s qualifications. If you’d like more information about us and what we do, request a free consultation today. We’re here to help, every step of the way!